Mechatronics Master's Degree: Am I Ready to Take the Next Step? Mechatronics is a field that combines electronics and mechanical engineering. Using knowledge in multiple disciplines, the mechatronic engineer can ensure electrical and mechanical systems work together. In the past, electronics and mechanical engineering were usually thought of as separate. Advances in technology have created new ways for these systems to work together, giving rise to an exciting field. Engineers practicing in either area have a leg up on learning mechatronics. Even if the term isn’t familiar, mechatronics is used everywhere today. The American Society of Mechanical Engineers recognizes mechatronics as an idea coined more than 40 years ago by Japanese engineer Tetsuro Mori. Mori was describing a special electronic control system designed for mechanical factory equipment. Not surprisingly, mechatronics is still closely associated with automation. One fascinating area mechatronic engineers can choose to work on is robotics. Rather than resembling sci-fi aliens, an industrial robot is an automated, reprogrammable device that manipulates its 3D environment. Mechatronics engineers often design and build the control systems automated equipment relies on, since software must be able to send electronic signals to mechanical devices. This helps machines respond to the operator’s input and any changes in the environment. Depending on their interests, mechatronic engineers may specialize in robotics, electronics, manufacturing, mechanical devices, software, applications, or pure data science. Each one has a role to play in making systems safer and more reliable. What Are the Top Industries for Mechatronics Engineers? When it comes to their industry of choice, mechatronics engineers have many options. Industrial manufacturing remains a popular place for mechatronics. Engineers get to work on many different systems and grapple with interesting technical issues. The systems they create are used to fabricate products and equipment for various other industries. The automotive sector has used mechatronics to become more efficient than ever before. Mechatronic tools help to create and construct many pieces of the average vehicle. They are also used in painting exteriors and for safety testing. Some mechatronics engineers specialize in engines, other internal systems, and the ways they communicate with onboard computers. Others have been recruited to develop the autonomous vehicle systems that may soon transform the way the world drives. If you have always loved flight, mechatronics may be an ideal field for you. Aerospace firms are among the biggest users of mechatronic expertise. A passenger jet is one of the most complex of all mechatronic systems. The electronic “nerve system” of the plane must work with every part of its mechanical body to deliver safety and performance. Many find this a satisfying challenge. Mechatronics is a huge part of military equipment, especially aircraft and ships. As armed forces modernize around the world, mechatronics engineers will be called upon to find ways to keep personnel safe – up to and including things like the battlefield exoskeleton. Last, but certainly not least, the medical field has been a huge beneficiary of mechatronics. In fact, mechatronics is at the forefront of a new generation of prosthetics. Starting with limbs, engineers are now exploring how precise, responsive prosthetic hands could become a reality. That may someday lead to much higher quality of life for accident victims and other patients. Most mechatronics engineers have advanced degrees in the field. They typically have 3-5 years of experience in mechanical engineering, electrical engineering, or an allied field before they look for more advanced training. However, more students are opting for a mechatronics focus. Seeking a promotion or the chance to lead a larger team. Pursuing an interest in bigger or more complex projects. Wanting to stand out as an expert among industry peers. Sharpening skills as part of a commitment to learning. Developing the insights needed to launch a business. Since engineers are working professionals who often have a tough work schedule, it’s not unusual for them to pursue a master’s degree online. Online studies enable them to interact with instructors and classmates from the convenience of home, fitting classes into their busy lifestyle. Many engineers find that an online course of study helps them learn faster, too. It is easy for them to collaborate with their classmates on projects no matter where any of them live. They can also meet other engineers dedicated to self-improvement – a great networking opportunity. Any engineering professional who sees the potential in mechatronics and wants to take the next step should consider further studies. Choosing the right master’s degree program is an essential step in gaining confidence and reaching your goals faster. 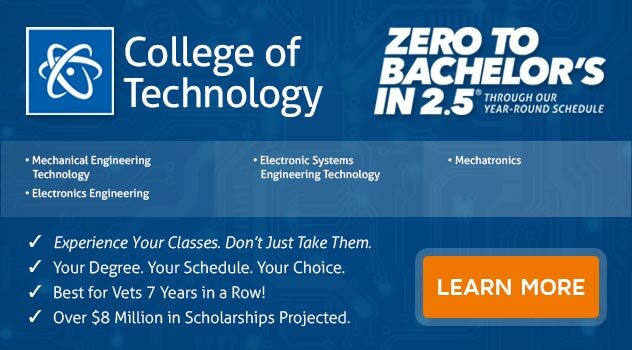 Are you interested in working in the mechatronics field? If you want to earn a Master of Science in Systems Engineering Degree with a Concentration in Mechatronics, consider ECPI University. With online and in-person education options, you could graduate sooner than at a traditional university thanks to our year-round, accelerated program. For more information, connect with a knowledgeable admissions professional today.